What a change has been brought about through the introduction of espresso pods to the whole coffee experience! For those who choose it to be so, the days of making espresso coffee by using a espresso machine where the coffee grounds had to be carefully placed into the portafilter, tamped into place and the portafilter group the locked into position, are over. More than just espresso pods, the growth in range of coffee pods is set to revolutionize the way in which coffee and espresso will be enjoyed from this moment onwards. It really cannot be simpler; the ese pods – easy serve espresso pods – are self contained single serve cartridges that contain the correct and precise amounts of coffee grounds to be able to make the perfect espresso. The coffee pods and the hot chocolate pods and the tea pods all share the same basic design. Each cartridge is filled with the correct ingredients in the correct amount as well as in the correct proportion one to another to produce the best result every time. 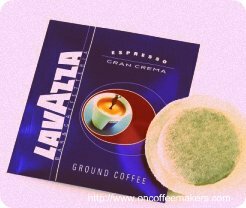 Whether you believe in the Lavazza pods or the Senseo pads by Douwe Egberts and Philips, or the T-Discs by Tassimo from Bosch or the K-cups by Keurig or even the Nespresso capsules by Nestle – each is essentially a cartridge loaded with the precise ingredients you need to make one portion of your favorite beverage. This is the essence of the “revolutionary” nature of the espresso pods. There is no wastage. There is no need to purchase large volumes of coffee beans that need grinding or bags of coffee grounds for that matter. Some of the coffee houses will offer variety packs, i.e. these is more than one type and flavor of espresso or coffee contained in the pack which allows fro a variation of coffee experience – one cup at a time. The espresso and coffee pods will save you money and they will save you time – two “valuable” commodities in times we live in. The enjoyment of one cup at a time on demand will also reduce the amount of wastage of grounds and coffee that is usually associated with a drip filter machine. The ese pod system allows for one portion at a time of the beverage of your choice. Given the short brewing time it is quite simple to brew a second portion immediately there after if you have a guest. It is merely a matter of time before the ese pods will replace coffee grounds as the “basic” household coffee grocery item.